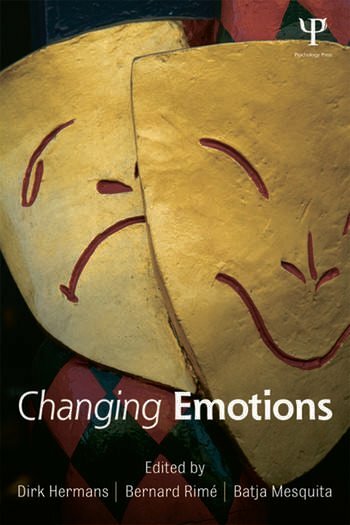 The question ‘how far can emotions be changed?’ lies at the heart of innumerable psychological interventions. Although often viewed as static, changes in the intensity, quality, and complexity of emotion can occur from moment to moment, and also over longer periods of time, often as a result of developmental, social or cultural factors. In each chapter an internationally renowned scholar presents a concise review of key findings from their own research perspective. The book will be of great interest to researchers in the area of emotion and emotion regulation as well as related fields such as developmental psychology, educational psychology, social, clinical psychology and psychotherapy. It may also be of interest to sociologists, philosophers, and economists interested in learning more about emotions. Hermans, Rimé, & Mesquita Preface. Lifespan perspective: Levine, Kaplan & Davis, How kids keep their cool: Young children’s use of cognitive strategies to regulate emotion. Fivush, Defining and regulating the self through emotion narratives. Eisenberg, Spinrad & Betkowski, Age-related changes in empathy-related responding. Camras & Shuster, Children’s expressive behavior in different cultural contexts. English & Carstensen, Age differences in emotional experience and regulation. Marc & Woltering, Changing the neural mechanism in of emotion regulation in children with behavior problems. Learning perspective: Mineka, Individual differences in the acquisition of fears. Craske & Vervliet, Extinction learning and its retrieval. Nelson, Mechanisms of extinction in emotional regulation. Hermans & Baeyens, Generalization as a basis for emotional change: perceptual and non-perceptual processes. de Jong, Learning mechanisms in the acquisition and maintenance of disgust. Richardson, Callaghan, & Li, Preclinical analysis of developmental transitions in the extinction of learned fear: From infancy through adolescence to adulthood. Social-cultural perspective: Rimé, Can socially sharing emotions change emotions? Yzerbyt & Kuppens, Group-based appraisals to group-based emotions: The key role of social interactions. Levenson & McCarter, Couples emotion and emotion regulation. Paez, Espinosa & Bobowik, Emotional climate. Tsai, Dynamics of ideal affect. Deleersnyder & Mesquita, Emotional acculturation. Emotional dynamics perspective: Frijda , Emotion regulation: two souls in one breast. Moors, Understanding emotion change requires understanding emotion causation. Fredrickson, Learning to self-generate positive emotions. Ochsner, The role of control in emotion, emotion regulation and empathy. Thiruchselvam & Gross, What time can tell us: the temporal dynamics of emotion regulation. Van Mechelen, Verduyn, & Brans, The duration of emotional episodes. Intervention perspective: Pennebaker, Can expressive writing change emotions? An oblique answer to a misguided question. Holmes & Pictet, The powerful impact of mental imagery in changing emotions. Watkins, Cognitive mechanisms involved in therapeutic change for depression: reducing abstraction and increasing specificity. Barnes-Holmes & Hughes, A functional approach to the study of human emotion: the centrality of relational/propositional processes. Strauman, Klenk, & Eddington, Self-regulation as a mediator of change in psychotherapy. Philippot & Heeren, Mindfulness-based interventions: The dialectic of changing emotion by accepting them. Les Greenberg, Postscript. Dirk Hermans is Professor and the Director of the Center for the Psychology of Learning and Experimental Psychopathology at University of Leuven, Belgium. His work focuses on associative learning and fear, autobiographical memory, and the study of the automatic affective processing of stimuli. Bernard Rimé is Emeritus and Invited Professor at the University of Louvain at Louvain-la-Neuve in Belgium and is a Past President of the International Society for Research on Emotion (ISRE) and of the Belgian Psychological Society. His research examines how emotional episodes stimulate interpersonal and collective communication as well as the consequences of sharing emotions with others. Batja Mesquita is a Professor and the Director of the Center for Social and Cultural Psychology at the University of Leuven, Belgium. Her work focuses on the cultural and social constituents of emotion and emotion regulation. She is currently a Senior Editor for Psychological Science.